Keep your knives sharp. But be sure to keep them out of reach of children. Dull knives can slip while you’re cutting. Also, you’re more apt to be careful with sharp knives. Slice away from your hand and keep your fingers clear of the blade. Slicing away from your hand prevents an accidental cut if the knife slips. Don’t ever use the palm of your hand as a cutting board. That’s just inviting the knife to slice into your hand! 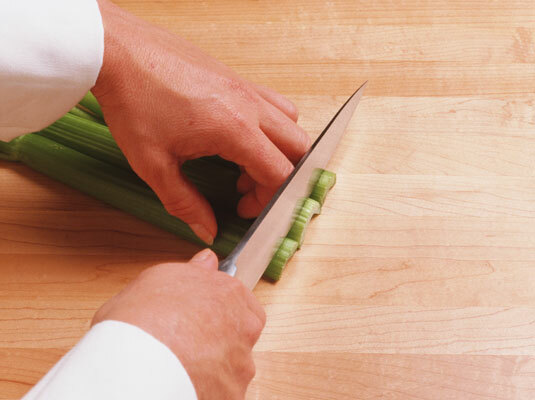 When mincing, keep the tip of your knife on the cutting board and pump the handle up and down quickly. However, because that knife is moving fast, be extra careful about your fingers. Curl your fingers under and hold the food with your fingertips when chopping. Better to ding a knuckle than slice a fingertip! Use caution with steak knives. They’re sharp enough to cut meat, which means they’re sharp enough to cut you. Don’t lick the cream cheese off that butter knife! It really can cut your tongue. Secure your cutting board. If it doesn’t have rubber feet to help grip the counter, put a damp towel under the board when cutting. Never slice things freehand over the sink. That’s just an accident waiting to happen! If you do cut yourself, wash the cut and apply pressure to stop the bleeding. Raise your hand above your head while you press the cut with a cloth or paper towel until the bleeding stops. Then, put antibiotic cream on the cut and bandage it.